Nous sommes désolés, mais l'espace Fully equipped meeting room in Frankfurt - Design Offices n'est plus disponible. 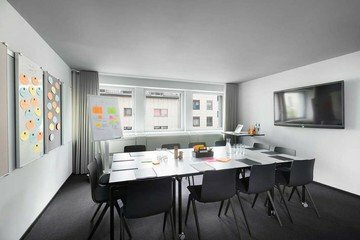 If you are on the search for a project room in Frankfurt, you have found the perfect venue. This large room can accommodate up to 10 people and is located in the center of Frankfurt. The large space is suitable, if you are looking to have a meeting with your project team or give a presentation for an entire department in a creative and relaxed atmosphere. You will have everything you need in this project room full of daylight with a size of 25 square meters, from catering options up to technical amenities. The guests will definitely be impressed by the inspiring location, after being welcomed at the luxury entrance and lobby. Your Frankfurt project room will automatically be equipped with some bloc notes and pens, which makes your brainstorming session an unforgettable one. Furthermore, there will be highspeed W-LAN, a flat screen with HDMI and VGA, adapter for Apple devices, whiteboards, flipcharts, pin boards, chalkboards and a toolbox. For an additional charge next to your rental price, you can rent an additional flipchart, a projector and screen, a flipchart block, Metaplan Board including the necessary tools, a facilitator’s box and if you need anything else, you can contact us to discuss options. In order to provide your guests with everything they could possible need, you can add drinks, snacks and lunch to your project room rental. The location is easily reachable by making use of both S-Bahn and U-Bahn, if you take S1,2,3,4,5,6,8,9 or U6/U7. 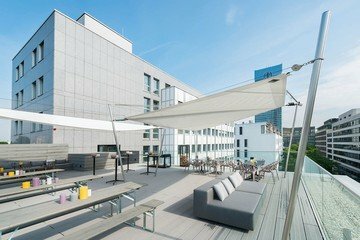 Guests from out of town will definitely appreciate the decision of this project room in Frankfurt, as it is only minutes away from famous hotspots such as the Main Tower, the old Opera building and the city center. For them, there are multiple hotels in the vicinity.